The Honduran AguaClara Program has been developing next generation drinking water treatment technologies to deliver safe water and meet the essential need of individuals and families in towns and cities since 2005. Over a period of 14 years, through implementation of a process of innovation, AguaClara Cornell and its main implementation partner Agua Para el Pueblo continually improved both its treatment processes and project management methodologies to support acceleration of the program and potential scale-up of activities across other areas of the world. Through public involvement, the program today ensures safe water, appropriate pricing for low-income residents, and the management of water supply and demand on a sustainable basis in support of the good health and productivity of the community. AguaClara is proven drinking water treatment technology that is cost effective and suitable for use in any village, town or small city. After successfully demonstrating the ability to transfer this technology to Honduras through a 2005 pilot demonstration project, the AguaClara Program in Honduras is today being delivered as a national initiative on a community-demand basis. This overview of the Honduran AguaClara Program presents background information on the importance of water for life, introduces the program and technologies in use, and discusses the benefits and costs to be realized through the provision of adequate water infrastructure and services to promote human health and productivity growth. The Honduran AguaClara Program is a partnership between AguaClara Cornell and Agua Para el Pueblo, with the technical and regulatory support of the National Water and Sewerage Utility (SANAA) and sponsorship by select international development partners, municipalities and users. Eighteen water treatment facilities that do not require electricity and have minimal maintenance requirements have been successfully installed to date. These facilities continue to provide safe, clean drinking water to low-income communities ranging in size from 170 to 12,000 persons. A new facility designed to serve 40,000 people will be commissioned in June 2019. The sustainability of the AguaClara Program is evident. Members of each beneficiary community continue to operate, maintain and manage the simple-to-operate treatment facilities, built completely of locally-sourced materials. Each month, each household in these low-income communities demonstrates both a willingness to pay and the ability to afford the low cost of water tariffs. Today, the AguaClara Program may be the best-kept secret of the water and economic development practitioner communities. This Case Study for potential client and partner organizations highlights the performance of three drinking water treatment facilities. 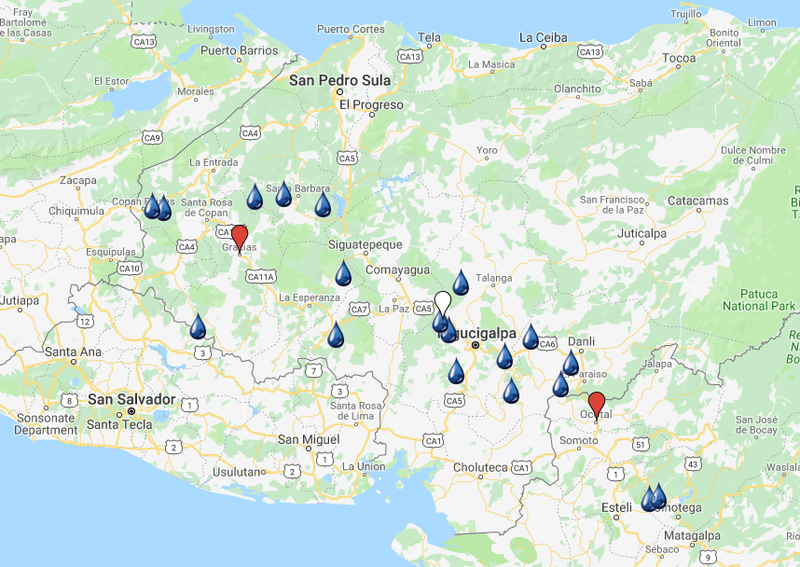 Each location required the Honduran AguaClara Program to tackle different technical challenges and propose effective solutions for delivering real results in closing the water security gap in the Republic of Honduras. The AguaClara Program is now being implemented in other countries through partnerships formed by AguaClara Reach, a non-profit organization established to facilitate universal access to safe water on tap.